Good afternoon from Butler & Bailey Market. I hope everyone is doing well. Rain seems to be the recurring theme these days, but it looks like we may go two or three days without any. The flip side of that is we might freeze to death in the process. For those who haven’t seen what the rain left, click here for a post from local station WVLT, showing aerial footage of West Knoxville flooding. Business has been good of late. All the heavy rain has actually helped us. It turns out access to some of our competitors got blocked by flooded streets, so we became the most accessible place for people to shop. I should probably feel sympathy for them, since their businesses were hurt by such a catastrophic event, but in my mind I’m thinking…Ha Ha! I finally got the upper hand on the big grocery chains…if only for a few days. I think those companies spend every waking moment trying to figure out how to run small, local folks like us out of business, so we enjoyed our few days “in the sun”, even as the rains kept falling. Everything seems to be getting back to normal now. The water has receded, and everyone can shop where they normally do. Now we have to get back to earning your business the old-fashioned way, which requires a lot more work than when it just falls in your lap. Oh well! That’s what we have been doing for the last twenty-nine years, so it’s pretty much all we know anyways. I am on a different work schedule this week. I am in charge of the kids for the next few days, so my work schedule has to coincide with their school schedule, as well as extracurricular activities. My wife is gone this week to watch a tennis tournament. I would have thought you could have found one to watch at say, the Knoxville Racket Club or some other tennis facility around town, but apparently the closest one she could find is in Indian Wells, California. This is day two of her trip, so she has probably had an anxiety attack by now wondering if our kids are getting fed and practicing good hygiene, much less showing up for school. I did make supper last night. I went for comfort food, since it was cold outside, and mom was gone. Comfort food for us usually includes fried okra, so we had pork chops and fried okra. I probably could have just skipped the pork chops, but I would have been frying okra all night. This family is like a bottomless pit when it comes to fried okra. The one upside to mom being gone is I can make all the food spicy, so the pork and okra had a heavy dose of “Slap Ya Mama” Cajun Seasoning on them. My kids and I love spicy hot food; mom not so much. At least I have done one thing right raising them. When I dropped the kids off at school this morning, I told them I would take them out to eat tonight, if they can get their homework done. I hope it works out because, if I have to cook every night, we may run out of clean plates and silverware before mom gets home. If you need a little comfort food for these cold or rainy days, you might want to try our menu last night. 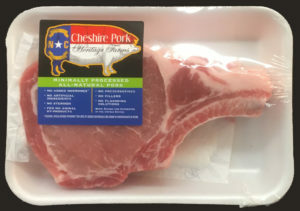 I got the thicker cut boneless Cheshire pork chops, and as of this morning, we have some really nice okra that came in prepackaged from one of our produce companies. I browned/seared the chops on both sides in a hot skillet with a little olive oil and a lot of butter. I then put the skillet in a 325° oven. Once I put the skillet in the oven, I started frying the okra. For the okra, I sliced it crossways, probably a little less than a quarter of an inch thick. I then put some cornmeal in a gallon storage bag along with seasoning. I started adding okra to the bag, stopping to shake the bag to make sure all the pieces got a good coating before I added more okra. 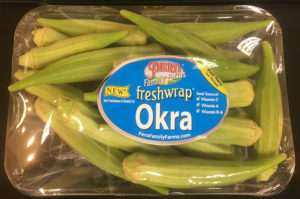 Okra is really sticky when it is fresh sliced, which is what you want. This helps the cornmeal stick to it, but if you dump all the okra in at once, it sticks to itself instead of the cornmeal. While I am doing this, I had cooking oil in a skillet heating up. The whole trick to this is making sure your oil is hot enough before you put the okra in. My grandmother used to put a match stick in the oil and when it lit, she knew the oil was hot enough. In the next breath she would tell us grandkids not to play with matches, so I don’t guess I’m allowed to use the match stick trick. I just dropped a piece or two of okra in to check it. You want it to start frying immediately, not just float around and bubble a little. Once you add the rest of the okra, the oil will cool a little, so you need to start off hot! It usually takes about ten or twelve minutes to fry which by default is how long I cooked the pork chops in the oven. They both turned out perfect. I guess if you aren’t using fried okra as a timer, eight to twelve minutes for the chops in the oven. This is probably not the most physically healthy meal, but it sure gave us comfort after all the rain, all the cold, and mom being gone. I hope everyone has a great week and thanks for letting us be a part of your community!